You’d think things couldn’t get much worse for Phyllis Summers (Gina Tognoni) on the Young And The Restless. Recently, she found out she had been duped for months by Kerry Johnson (Alice Hunter). She was then unceremoniously dumped as Jabot CEO and told she would be getting zero severance. But, as with anything Phyllis, she had a plan to recoup her losses and she put that plan into action. Ever the caring mother (insert sarcasm here), Phyllis offered to whisk her daughter Summer Newman (Hunter King) out of town for a couple of days to a spa. This was under the pretext that Summer needed some relaxation after having undergone transplant surgery. Summer saw through her ruse but agreed to go away with her mother anyway. Earlier that day, Phyllis had met with Lola Rosales (Sasha Calle) at Crimson Lights and planted the seed in her mind that Kyle Abbott (Michael Mealor) still loved her. She then paid someone to follow Kyle and Lola and had him take pictures of them as they shared a romantic dinner together at the Athletic Club. But unfortunately for Phyllis, her scheming backfired on her, big time. When Summer changed her mind and the pair returned to Genoa City, Phyllis confronted Jack Abbott (Peter Bergman) with the photographic evidence on Kyle. She then told him Jabot doesn’t need a scandal and tried to blackmail Jack to give her Fenmore’s. Later on Y&R, Jack told her there was no deal and Kyle was breaking up with Summer. Kyle did confess his dalliance with Lola to his wife but told her they didn’t take it very far and Summer immediately forgave him. Even though she knows he still loves Lola, she won’t give up on him. This makes her seem even more desperate than when she first married him. 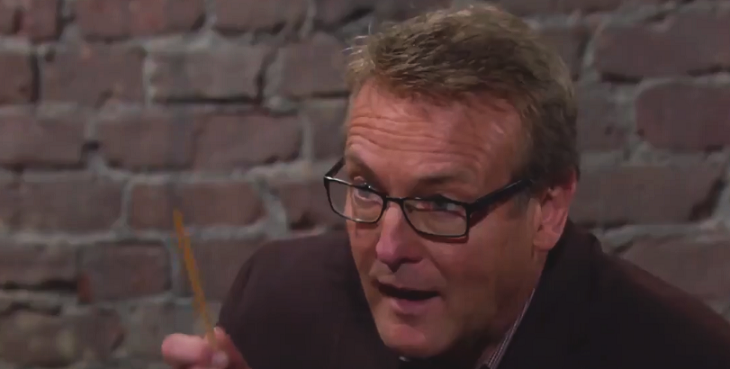 Meanwhile, Paul Williams (Doug Davidson) has given Rey Rosales (Jordi Vilasuso) a chance at redemption. He can have his job back if he solves one case. Sounds pretty simple, right? No way José! The case Rey needs to solve is one he’s already figured out – the attack on his sister Lola. Rey knows his estranged wife Mia Rosales (Noemi Gonzalez) was the one who callously attacked his sister. Sure, she thought she was kicking Abby Newman (Melissa Ordway) in the back, but what she did was still a crime. Y&R viewers know Rey has covered for her because she’s pregnant and he doesn’t want his baby (if it is his) born in prison. But now that Paul is expecting him to solve the case, what will he do? Will Rey turn Mia in or continue to protect her? Will you miss Gina Tognoni in the role of Phyllis on Y&R? Tell us what you think in our comments section.